May 22, 2009 -- Although molecular imaging as a whole appears in fine shape, reimbursement, the global medical isotope supply, and shaping the role of the molecular imaging physician are among the issues that challenge the medical specialty today and will continue to do so in the future. With the SNM's 2009 annual meeting just one month away, AuntMinnie.com gathered the perspectives and insights of outgoing SNM President Robert Atcher, Ph.D., and President-elect Dr. Michael Graham, Ph.D., on the state of molecular imaging. 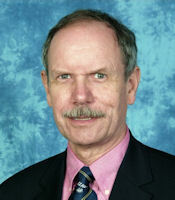 Outgoing SNM President Robert Atcher, Ph.D.
Atcher, a professor of pharmacy at the University of New Mexico/Los Alamos National Laboratory, noted that molecular imaging is on the brink of enhancing patient care to a greater degree by continuing to utilize physiologic and metabolic information derived from hybrid imaging for early disease intervention. With the promise of better patient outcomes on the horizon, SNM is keeping an ever-watchful eye on reimbursement and funding for radiology programs. 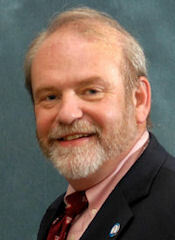 "When we talk to members of Congress, their view is that imaging has been increasing at too fast a rate," Atcher said. "Therefore, we have to cut back on the utilization of imaging, when, in fact, we are using imaging to substitute for more expensive procedures like exploratory surgery." Given Congress' tight reins on spending, Atcher and Graham advocate that molecular imaging research needs to go beyond only showing how the modality can positively affect treatment management. "We have to do studies where we include outcome and economic analyses to demonstrate the value of imaging," Atcher said. "We have to show that in the overall scheme of things, we are saving money and changing the outcomes for patients." SNM President-elect Dr. Michael Graham, Ph.D.
To help in that effort, Graham, who serves as the director of nuclear medicine at the University of Iowa in Iowa City, plans to organize a task force with representatives from the healthcare technology assessment field to help detail the essential elements of a "first-rate paper. Most of our literature is not up to par. We need to understand why that is the case and what we can do about it," he said. Like other organizations, SNM is watching healthcare reform proposals from the new Obama administration and any additional reimbursement reductions that may stem from the Deficit Reduction Act (DRA). "The DRA targeted imaging, and we have been doing Band-Aids to avoid rather substantial decreases in funds available to reimburse for imaging," Atcher said. "It has been a year-to-year battle for us and everyone in the imaging field, and it will continue to be a concern as [the Obama administration] becomes clearer on healthcare reform." Molecular imaging proponents received good news in April when the Centers for Medicare and Medicaid Services (CMS) handed down its decision to expand PET reimbursement from nine to 11 cancers, but the limit of one PET scan for Medicare beneficiaries with certain cancers fell short of SNM's expectations. "The irony of that decision was that [CMS] included determinations of success of therapeutic interventions, but they only agreed to reimburse for one imaging study," Atcher said. "In order to assess any kind of treatment, you have to do a baseline and you have to do an imaging study post-treatment. So, there is an irony in that we can't achieve one of the major objectives in utilizing PET for following cancer to assess whether a treatment regimen has been successful or not." Rather than being an end point for PET coverage, Atcher said he hopes the recent CMS decision is "a weigh station on the way to getting appropriate reimbursement to cover baseline and follow-up studies." One major issue that has dominated molecular imaging over the past year is the worldwide shortage of medical isotopes and molybdenum-99 (Mo-99). Calling the situation a "crisis," Atcher lamented that there is no solution on the immediate horizon. The best hope is the University of Missouri's expansion plans for its research reactor facility. Even then, it is expected to take at least two years before the reactor clears regulatory hurdles and comes online to potentially supply as much as 50% of the U.S. demand for Mo-99. "Everything else that has been proposed to date has a timeline that is optimistically seven years, and I would say more likely, 10 years," Atcher said. Graham said his own University of Iowa came to a "near halt" on one occasion because of Mo-99 supply problems. "It is increasingly clear that the molybdenum-99 supply is getting more and more fragile," he said. "It depends on only five reactors around the world and none in the U.S. We need both short- and long-term solutions." With the increasing role of hybrid imaging in healthcare, one of Graham's major initiatives is to create the molecular imaging position of the future. He co-chairs a joint task force between SNM and the American College of Radiology (ACR) to create a combined program through which physicians would be trained in radiology and nuclear medicine. "It would be three years of radiology and two years of nuclear medicine, with significant emphasis on some of the newer methodologies, including optical imaging," Graham said. "The idea for the pathway initially would be for individuals who are interested in an academic career and would become the medical scientist of the future." The task force plans to craft qualifications and other criteria for the position and the training program within the year. At that point, residency review committees from both SNM and the ACR would evaluate the proposal and decide whether to endorse it. If it comes to fruition, Graham expects that the top 20 to 30 accredited nuclear medicine and radiology programs across the country would participate. "There are at least a dozen institutions that would be able to participate right off the bat," he said. SNM also is working with the Radiological Society of North America (RSNA) to hold a day-long instructional session on PET/CT, with an emphasis on PET, at RSNA's 2009 annual meeting. Graham is working with Dr. Richard Wahl, director of nuclear medicine at Johns Hopkins Medical Institutions in Baltimore, on the initiative. The additional expertise for PET/CT could help alleviate the issue of whether a nuclear medicine technologist can perform the CT part of a PET/CT scan or if it must be done by a radiologic technologist. The second issue is who reads the study when it is completed. Currently, the standards vary from state to state. "Does it have to be a nuclear medicine physician to read the PET or a radiologist?" Atcher queried. "And can the nuclear medicine physician read the CT? We have been working to establish reasonable criteria for the nuclear medicine physicians and technologists to utilize this new technology, which has revolutionized nuclear medicine." In the past year, SNM also addressed one of its other major concerns -- the slow approval of new imaging agents in nuclear medicine. Graham said the organization's primary approach has been to "work with the [U.S. Food and Drug Administration (FDA)] to discuss the methodology and what is needed to bring new agents [to market] -- what is acceptable and what isn't." Those talks led to the creation of SNM's Clinical Trials Network initiative late last year to facilitate more cost-effective drug development through integration and standardization of imaging biomarkers into phase I, II, III, and IV therapeutic clinical trials. In February, the FDA approved an SNM-sponsored, multicenter investigational new drug (IND) application for fluorine-18-labeled 3'-deoxy-3'-fluorothymidine (FLT). The FDA allowed multiple sources of FLT to be evaluated, reviewed, and accepted for use under a single IND, and agreed to base the IND review process for acceptance of the various investigational FLT products on the end-product specifications. "This is a step forward for us, because it reflects the fact the FDA recognizes that even if we are not in a position to take some of the imaging probes to new drug approval status, there is still value associated with those radiopharmaceuticals in terms of developing drugs and gathering information on the impact or lack of impact in a clinical trial," Atcher said. The SNM annual meeting takes place in Toronto from June 13 through June 17.